100 measurements were done on the 1951 USAF resolution target. 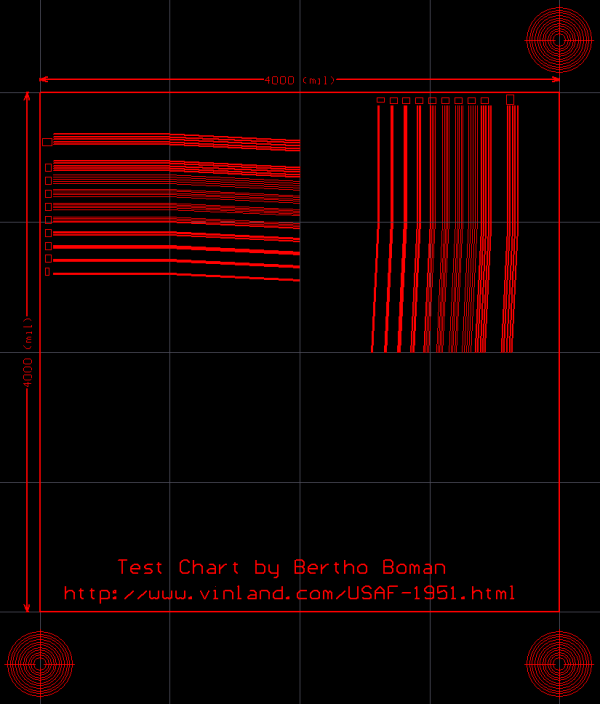 This chart is a resolution test pattern This chart is a resolution test pattern 101 conformed to the MIL-STD-150A standard, set by US Air Force in 1951. The USAF-1951 test image contains numerous standard elements that get continuously smaller in order to measure the actual resolution of a scanner. Each of the elements, as also the structure of the test target are standarized according to MIL-STD-150A that is an American military standard. Test targets are versatile and can be used for a variety of tests. Some, like the ISO 12233 chart and USAF 1951 Resolution Test Chart, will come up on most web searches.